The tenants of Marina One Residences who are looking for ways to entertain themselves in the area of Marina Bay will definitely enjoy the fact that one of the best casinos in Southeast Asia is only a short drive away from them. Read on and find out why you should not miss visiting Marina Bay Sands Casino if you are looking forward to spending an incredible night full of thrill. What does Marina Bay Sands Casino Offer? Spreading over more than 15,000 square meters, this casino is an integral part of Marina Bay Sands Resort, which is a project worth more than $5.5 billion. This spectacular casino offers more than 30 private gaming rooms, almost 500 gaming tables, and an incredible 1500 slot machines. What you get in this gaming paradise near Marina One Residences is the mind-blowing collection of the freshest, widely popular electronic gaming machines, with more than 250 different games that you can check out. If you are not a smoker, you shouldn’t worry either, since the casino provides an area for the gamers who don’t smoke. Apart from the spectacular gaming and betting offer, you will also be enchanted with the majestic casino interior. What instantly attracts the attention of all visitors when it comes to the design of this space is the luxurious chandelier which is considered one of the largest one in the world. It weighs more than an unbelievable seven tons, and it is beautifully ornamented with more than 130,000 Swarovski crystals. What else can you do at Marina Bay Sands? If you didn’t know that the casino area occupies only three percent of the total area of Marina Bay Sands complex, you should definitely pay attention to the rest of its offer, too. 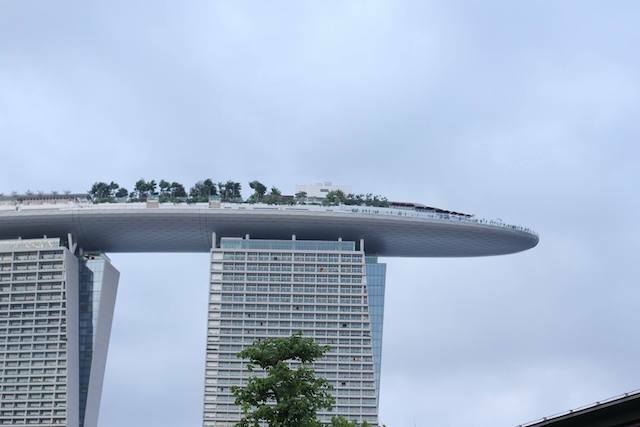 When you get tired of gaming and gambling, you would probably be happy to spend some time at the incredible Sands SkyPark that will enchant you with the open view of Singapore at the height of 200 meters. You can also enjoy the natural ambience of the amazing tropical gardens, modern nightclubs, and restaurants, as well as an infinity pool. The shopping arena also has a linkway that leads to the iconic Gardens By The Bay where you can enjoy an evening stroll after your activities in the complex. Where is Marina Bay Sands Resort located? Situated only 10 minutes from Changi International Airport, Marina Bay Sands Resort and Casino is located in the heart of Singapore, in the prestigious area of Marina Bay Waterfront, at 10 Bayfront Avenue. This location makes it easily accessible from Marina One Residences. Just a tip for you, make sure to dress appropriately since you cannot enter the casino wearing sleeveless shirts, short pants, flip-flops or slippers. Find out more about the condo price of Marina One Residences in Singapore and the amenities located conveniently around the location. See for yourself that this is definitely a condo worth investing in!